I've highlighted five research projects presented in the session 'Textile Messages: Electronic Textiles as Disruptive Designs and Inclusive Activities' during my trip to California for the Digital Media and Learning Conference. Read the full post on SparkFun Education's blog. My colleague Melissa Felderman and I were chosen as speakers for the 2018 SXSW festival in Austin, Texas. We will be cohosting a session on wearable electronics. 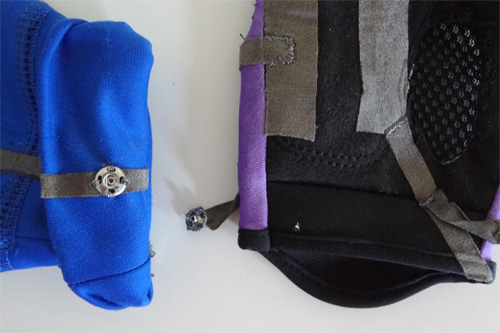 Join a discussion around sewable, soft, and wearable electronics for the hobby and handmade level. 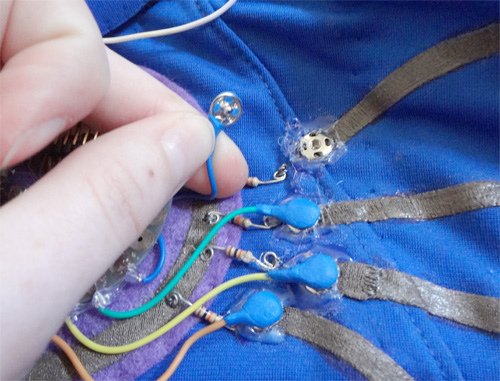 Learn about tools and products designers need to develop handcrafted wearable electronic projects. Engage in Q&A with experts in hobby level electronic product development and project creation. Discuss the challenges facing soft electronics, how to work around them, and how working with these materials taught them lessons in design thinking. Bring projects and ideas to share and discuss! Date and time for the workshop TBD, stay tuned with future updates as SXSW releases more session details and programming. 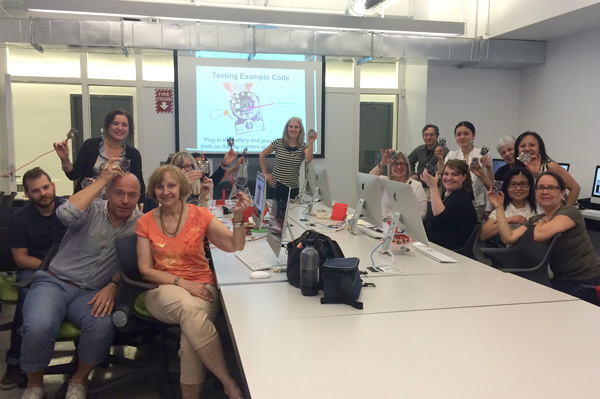 Earlier this year I had the opportunity to fly out to teach at the Fashion Institute of Technology in New York City for SparkFun. Read all about my experience over on the SparkFun blog. 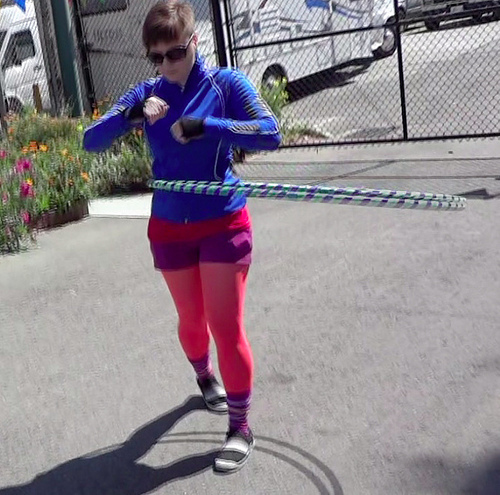 Here are a couple of detail pictures and videos of the hoop prototypes I brought to Maker Faire. I’ll have a longer post later in the week with all the cool stuff I saw and played with while wandering around the faire grounds. I wasn’t able to shoot great video at the faire because of the noise, so the two I included were shot in my hotel room (hooping indoors is quite a challenge!). 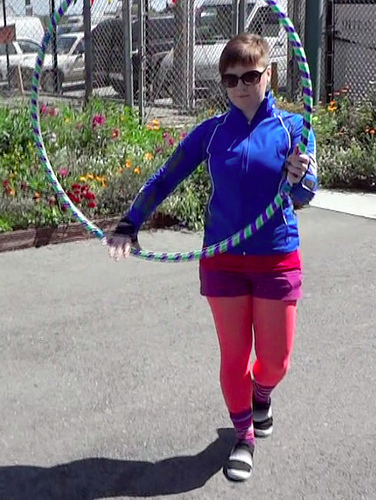 I’m hoping to bring these pieces to a hoop jam and have some other hoop dancers try them out soon. I mostly wore the sound making outfit around during the weekend, as my light up one was hard to see anywhere but inside the darkened Fiesta Hall. It was fun to wander through the crowds and do mini demos along the way. This is a slight variation on the beatbox hoop prototype I blogged about previously – instead of a hacked toy I used a LilyPad Arduino to make notes for each of the conductive patches. Many thanks to my fellow Seacoast Maker Alex Nunn for helping me with some last minute code on this one before I left for the faire. 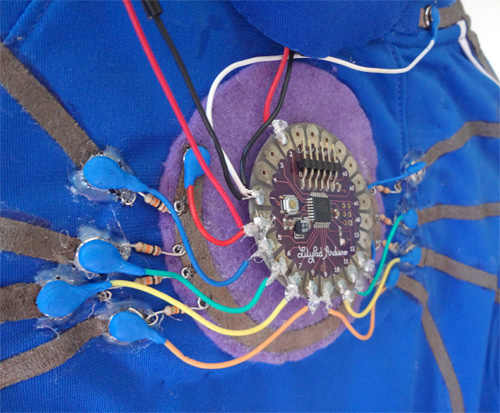 The nice thing about this particular jacket is that the board is completely modular; sewing snaps allow you to remove the LilyPad from the traces and speaker and pop in another one in the same configuration. I also used Sugru to add a finishing touch and a little extra protection to the connection between the snaps and the wires going to the LilyPad. I stopped by the Sugru booth and they loved the use of their product in wearables. The first prototype is a little messy with some hot glue to make sure things didn’t fall apart with all the movement. The outfits held up well after two days of hooping, with only minor repairs needed. 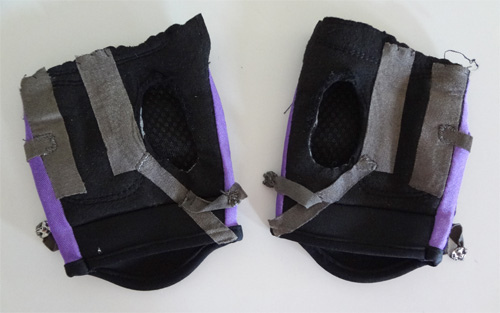 I modded some gloves with conductive patches so that I could create effects while hooping on my hands as well. They snapped right into the sleeves of the jacket. This is a completed version of my early experiment with LEDs. A small battery holder, conductive fabric, and LEDs make it a nice blink and bling example of my hoop-as-a-switch concept. This little battery holder from Aniomagic worked well on the collar of this jacket. Unfortunately, it looks like they don’t make them anymore. After a whirlwind month of two maker faires – the Cambridge Mini Maker Faire and the Bay Area Maker Faire, I am ready to take a brief vacation from blogging. I’ll be working on a few projects throughout the summer and I hope to share them along the way or when I start blogging more often in the fall. See you then and enjoy your summer! Here are a few pics from my trip to San Mateo for Maker Faire. I had a great time doing a demo at the CRAFT booth on getting started with soft circuits. 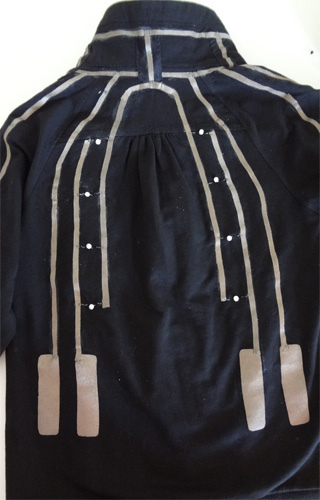 I had some examples of conductive threads, fabrics, and kits to show and pass around. I met up with Dia, Sparkfun’s TechStyle Specialist, who had a cool sound-making dress with conductive flower petals and conductive threads as the triggers. I got to stop by the Instructables HQ in San Francisco, so exciting! 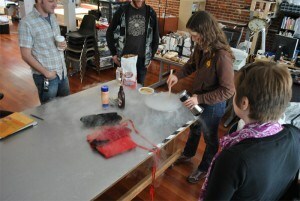 We made some liquid nitrogen ice cream and got a tour of the office. It’s been one week since I traveled out to Queens to experience the first World Maker Faire at the New York Hall of Science. I had an amazing time seeing some familiar faces of my fellow makers and meeting lots of new and interesting participants and faire-goers. The event had a bit of a different feel than the Bay Area Faire back in May. Many of the makers were outside in tents, lending it more of a craft faire or street faire feel than the expo setting of everyone gathered together in a big warehouse. I was located near the CRAFT area and close to the Bust Craftacular where it was a little more low key than the main traffic areas. Many of the makers were located inside the New York Hall of Science scattered between the museum’s permanent exhibits. It was an interesting (though sometimes confusing) combination of the stationary exhibits and the maker booths. 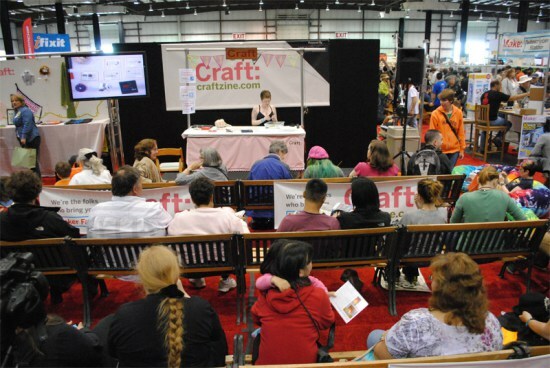 In addition to displaying my projects at a booth, I was also invited to do a demo at the CRAFT booth on my ‘Talking’ Sock Puppets. There was a great turnout and I had a lot of fun talking to folks after the demo about how they could make their own noise making puppets at home. The puppets even earned an Editor’s Choice blue ribbon – they were a big hit with kids and adults alike. I was lucky enough to have the folks of Fabrickit as my neighbors during the faire. They launched their new product line and I was able to chat with them about it and purchase a kit to bring home and try out. I will be posting soon about my experience with their modules. Inside the Hall of Science I stopped by Sarah and Lara Grant’s Felted Signal Processing table – they are using conductive and metallic fibers combined with wool to felt their own sensors and controllers for sounds. The pieces have a wonderful texture and sculptural quality to them. Many of the other soft circuit and wearables makers who presented at the faire were also in the eTextile Fashion Show organized by Lynne Bruning. Unfortunately it was scheduled at the same time as my sock puppet demo, but my friend Rebecca was able to capture some video of it for me to compile and share. While I wasn’t able to experience the full faire, the friends who traveled with me were nice enough to watch my booth a few times so I could wander around and see some things for myself. I watched a Life Size Mousetrap performance and caught the last Arc Attack show of the weekend, two things I regretted not being able to see in person while wandering around the Bay Area Faire. Many thanks to Rebecca, Erin, and Randy for their help with photography and video of the faire! Check out more Maker Faire images/video on my Flickr and Youtube pages. I’m happy to announce that Soft Circuit Saturdays will be at the first World Maker Faire in New York next month! This will be my 3rd time attending a Maker Faire event, and the first time I will be participating in one of the ‘big’ faires with a booth and projects to share. It’s going to be an amazingexperience to be in the midst of so many people – I’m very excited! I will be bringing a few things I shared atCambridge Mini Maker Faire, along with some new pieces. I’ve decided to make sure that most of the projects that I bring along will have tutorials and DIY instructions available either on this site, Instructables, or Make:Projects. That means I’ll be spending the next few weekends putting together how-tos, getting everything prepped for the faire, and finalizing my travel plans. Instead of my weekly posts of projects and builds, I will be posting links to interesting projects I find on my Facebook page, and possibly publishing a round-up or two along the way. I have a few friends who will be traveling with me to help document the faire and the other soft circuit projects and makers that will be there, so stay tuned for photos and videos in the weeks after the event. Check out all my tutorials over on Make: Projects to learn how to make your own versions of these pieces. The e-textile show was a hit, showcasing some projects involving lights, sensors, and augmented clothing. I snapped a couple of pictures after the show; these are only a few of the projects that walked the runway. I had a great spot in which to view the show, but unfortunately, a large garage door was open directly behind the stage. The light pollution kept those of us in the audience from the full experience of the light up projects. ArtFuture was able to capture a good video of the show and they will be uploading interviews with the designers this week. On Sunday, a different kind of wearables show hit the runway – this one based around either evading or inviting surveillance. I really enjoyed the thematic element and the creative ways the designers thought to affect surveillance methods such as cameras, face recognition software, and even watermarking on currency. Adrian Freed gave a great presentation on e-textile materials, sourcing, and applications. He showed a few of his own pieces that involved using e-textiles as musical controllers and introduced his portable lab (which he was even able to bring on an airplane). I was able to capture most of it on video (aside from a few minutes of the question and answer session at the end). Helping Becky out with her Craft demo. More pics here. Becky Stern’s demo of electronic embroidery was a lot of fun. I was able to act as an extra set of hands for her while showing the audience how to sew with conductive thread, and passed things around to the crowd to check out. I brought a couple of my projects along with me to add to Becky’s soft circuit examples. Below are a couple of video excerpts (the whole demo was about 45 minutes long). The best part of Maker Faire was talking with fellow makers and tinkerers who share my excitement for creating and experimenting. In addition to watching some fabulous demonstrations, I was also able to catch up with some soft circuit peers that inspire me and with whom I share projects through twitter, facebook, and flickr. Syuzi Pakhchyan of Fashioning Technology, Nwanua Elumeze of Aniomagic, Shannon Henry of Polymath Design Lab, and Lynne Bruning were some of the great people whom I finally got to meet in person. Here are some more soft circuit/craft/sewing photos from the faire, and I have an album for the rest of Maker Faire over on flickr. Countdown to Bay Area Maker Faire! Today I started packing my bags for my first trip out to San Francisco. I’m flying out Wednesday to visit a friend, do a little sight-seeing, and check out the Bay Area Maker Faire. It’s going to be a ton of fun! I’ll be armed with my camera, a camcorder, and lots of energy as I visit as many booths/demos as possible and try and meet some of the makers who have been inspiring my own projects. Lynne Bruning, textile enchantress and soft circuit superstar, has organized the Maker Faire’s first wearable computing fashion show. I’ll be there to see some of these pieces in person, and if time allows, meet and talk to a few of the designers. Learn about crafty conductive materials and how you can integrate them into your projects! CRAFT Associate Editor Becky Stern with special guest Angela Sheehan will show lots examples of conductive thread embroidery, soft switches, and other craft-tech goodies. Becky was kind enough to invite me to show a couple of my projects during her demo – I’ll be bringing the Musical Jellyfish and the Temperature Sensing Tea Sleeve as examples of crafting with electronics. And of course there are a ton of other non-soft circuit projects and demos happening that I will be scoping out as well. I won’t be making a post during the faire, but I will probably be posting a few pics on my Twitter. Stay tuned! Last weekend my friend Erin and I attended the first public workshop on paintable electronics/paper computing held by the High-Low Tech group at the MIT Museum. Part of the Cambridge Science Festival, it was a day-long (10am-5pm) demonstration and work session using conductive paints, batteries, and computing components to make interactive paper artworks. When I attended the TEI Conference back in January, I was able to play with the Electronic Popables project by Jie Qi; it is a truly phenomenal example of combining paper engineering/pop up techniques with electronic components and conductive materials. I was so excited to participate in this workshop and try my hand at this new way of combining craft and technology. For the first part of the session, Leah Buechley and her graduate students Hannah Perner-Wilson, David Mellis, and Emily Lovell showed us some examples, including a paper piano, light-up flying spaghetti monster painting, and a piece of paper with a bend sensor built in that changed tones as you moved it. We then used sticky notes to practice painting conductive paints and started to draw/paint a simple circuit with an LED in it. Getting used to working with the paint was tricky and it took awhile to dry, but after a little practice we were creating interesting designs. We then moved on to making switches and battery holders by painting the conductive paint on pieces of paper that we attached to parts of our circuits. My first experiments with a painted circuit. We glued down LEDs and literally painted the traces on top of the leads. Testing out a circuit. Conductive paint under the brad allowed me to slide it and turn on a LED when I lined up the paths. You can see a few places where I was still learning to use the paint and it got a little messy. The white stickers under the LEDs covered some mistakes/spills that shorted out my lights. Here’s a video of Erin’s circuit, a mix of origami and drawing to make a lily pad design. After lunch we were given kits that included LEDs, a speaker, a chip pre-programmed with some functions (fading/blinking lights, an input for a switch or sensor, and an output for a speaker) and made more complicated paper circuits. I kept mine simple with some lights, but there were some really creative and interesting results from other participants. Erin made an awesome jukebox that incorporated the painted traces beautifully. The participants were a mix of people who were interested in art, engineering, and science; a few had worked with sewing circuits and some had never worked with electronics at all. It was a lot of fun walking around and seeing all the different ways we used the components to make our projects. Leah and her students were really engaging and helpful and took the time to help each of us troubleshoot our circuits and offer advice and hints on working with the conductive paints. I had a great time at the workshop and am hoping to purchase some of the paint we used and gather some friends to experiment with it at home. One problem that I was discussing with High-Low Tech student Emily Lovell was the fact that the paint oxidizes and you have to use it before it goes ‘bad’. Right now the paint is sold in fairly large quantities so I would have to do a lot of painting or find a lot of people to paint with me. Another issue was that the paint tended to separate, so the bottles we were using to apply the paint with needed to be shaken frequently or the traces would not work as well. Working with electronics and paper made me realize how much improvisation goes into my soft circuit projects. Since the connections were painted, it meant I had to plan and sketch out my ideas in advance. Most of my sewing projects are pretty flexible/adaptable because I can take out a seam here or there, and thus I sort of make them up as I go along. It was an interesting exploration and I can’t wait to see more from the High-Low Tech as they develop the Teardrop paper computing kit and components further. http://www.flickr.com/apps/slideshow/show.swf?v=71649There are also some photos of the workshop on Hannah Perner-Wilson’s flickr account.